Bryce CM, Baliga VB, de Nesnera KL, Fiack D, Goetz K, Tarjan LM, Wade C, Yovovich V, Baumgart S, Bard DG, Ash D, Parker IM, and Gilbert GS. 2016. Models in the NGSS Biology Classroom. The American Biology Teacher 78(1). In Press. Tarjan, LM, de Nesnera, KL & Hoffman R. 2015. Authentic science investigation in the classroom: Tools for creating original testable questions and graphical hypotheses. Science Scope. Fellows collaborated with teachers to produce video clips that serve as an introduction for students on topics covered in the various learning modules. Access these videos by clicking on the image below or going directly to the SCWIBLES YouTube channel. 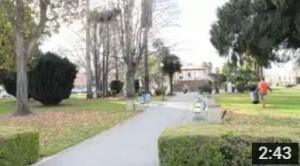 “What’s Your Walk Score: Walkable neighborhoods as healthy, social and safe communities”. Students, particular those in low income communities, are increasingly faced with poor nutrition and exercise options. One way to combat this while also building community is to teach about walkable communities. Presentation Skills. Produced by SCWIBLES fellows, this video is designed to help anyone improve their skill at presenting information to a group. 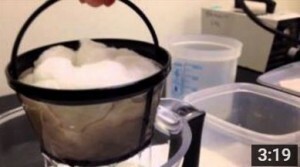 Oil Pollution Solutions. 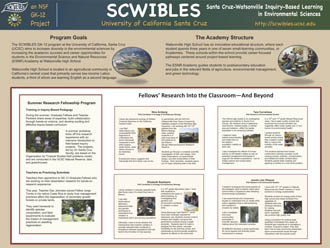 A video to accompany an inquiry based educational activity (module) used in the SCWIBLES program. Created by Kristin de Nesnera. Physics of Motion: How far can you hit the ball? 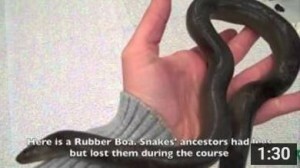 A SCWIBLES video that explains the use of “Tracker”, a free software app. 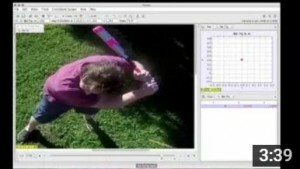 Tracker allows you to gather physics data on the motion of any moving object seen in a video. Inquiry Boards. 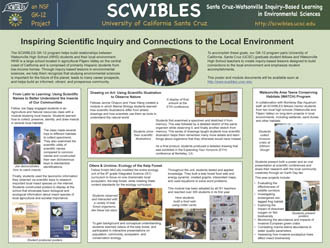 SCWIBLES fellows Kristin deNesnera and Max Tarjan and SCWIBLES teacher Rob Hoffman, created this video to help teachers and students understand the steps in a scientific investigation. Round & Round It Goes: Getting dizzy in geosynchronous orbit. A SCWIBLES video used as an intro to the Geosynchronous Orbit module created by Caleb Bryce and Stephen Buchter. Size Matters: Understanding the surface area-to-volume ratio. Fellows Kim Goetz and Caleb Bryce produced this video explaining the concept of surface area to volume. 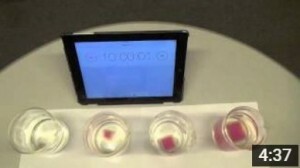 A diffusion experiment using colored agar cubes, and various real life examples are used to help students understand this concept. What’s Stomata With You? : Using leaf epidermal peels to determine stomatal density. Fellow Catherine Wade produced this video to explain the concepts behind leaf stomata and their importance in regulating water loss in plants. Convergent Evolution. 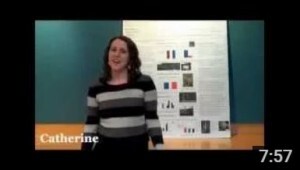 This video was produced by SCWIBLES Graduate Fellows; Elizabeth Bastiaans, Tara Cornelisse, and Jennifer Ohayon. Hold your breath! 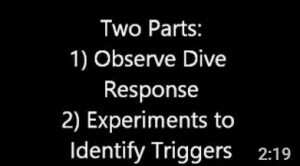 Fellow Vikram Baliga produced this video to accompany his Dive Response module for inquiry-based education in high school science lab. Colors in Chemistry! Using paper chromatography to understand polarity. 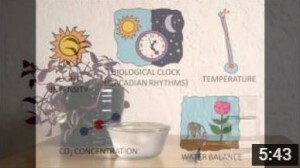 A SCWIBLES video to accompany our hands-on inquiry-based module on paper chromatography developed by Fellows Rachel Zuercher and Chandra Goetsch. Tarjan, LM, de Nesnera KL & Hoffman R. 2015. 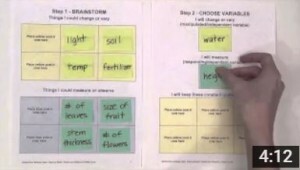 Authentic science investigation in the classroom: Tools for creating original testable questions and graphical hypotheses. Science Scope. In Press. Jenkins, J. 2015. Contested terrain of extractive development in the American west: Using a regional political ecology framework to understand scale, biocentric conservation values, and anthropocentric resource utility. Journal of Political Ecology 22. In Press. Jenkins, J. 2015. Review of “Gambling on Ore: the nature of metal mining in the United States, 1860-1910”, by Kent A. Curtis. Journal of Material Culture 20. In Press. D. Fiack with Kamieniecki, S., Cahn, M., D. McCain-Tharnstrom. 2015. The Bureaucracy and Politics of Energy and Environmental Policy in the Western States in Smith, Z., and J. Freemuth (Eds). Environmental politics and policy in the West. University Press of Colorado.